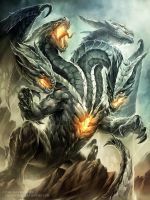 In the land of Altria roam many ancient and power creatures, but none are as infamous and as feared as the ancient dragons. Monstrous beasts with an unquenchable greed and a desire to spread pain and misery to those they deem as lesser beings. These beasts were once chosen by the gods to be the protectors of the realm, however they soon fell victim to their vices. However, among their numbers a defiant hero stood. Timaeus was one of the few members of his race to heed the call from the gods and thus, became known as a hero to humanity and a foolish traitor to his own kind. 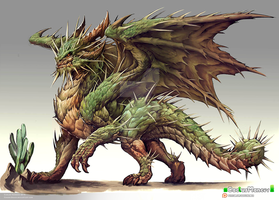 For centuries the dragon knight heeded off great evils and fought alongside the humans of the realm in great battles. However eventually the great hero would fall. Having been fatally injured in battle, Timaeus used the last of his power to seal away the Black Witch, a being who sought to drain the life from the realm and plunge it into darkness. To this day the bones of Timaeus still guard the tome of the Black Witch and his spirit keeps her at bay. Forever will he stand guard and forever will he be remembered as an honourable hero." Magnificent Artwork. Great display of a fine, noble beast! I love the detail on this dragon, just amazing. I like the idea of giving dragons too strong feeling of racial pride, which sometimes is breaking the limits. I mean like with such powers, wisedom and lifespan, dragons definitely should feel themselves proud to be who they are. This is sick! Love it. thanks for you my friend! I love that season, do you? So beautiful! Love the armour! Nice. Blind Guardian is also the name of an awesome hard rock band. You should check them out if you're into that kind of music. yeah, is a great band, a little tribute, thanks! Anyway this guy (or girl) looks pretty strong! What does he/she guard? Also I wonder how this Black with looks alike. But what I also like is that you showcased dragons as a nation, which is way better than showcasing as animals. Plus the reason to be mostly evil (in this case) - because of thinking of themselves as of supreme race (principle of "stronger species survive"), not because of masters behind. Hi, I'm the one who commissioned this piece and wrote the backstory, thanks for your kind words about the story since it's actually something I've been working on for awhile. Welcome. Always loved them as a race. No matter of allegiance. No problem, you did an awesome job on it!